Being a Supply Chain Management Summer Associate is an exciting and rewarding adventure. As a young professional, you will gain invaluable career experience in the world-renowned UPMC health system. Throughout the summer you will be completing various projects (yes, real work!) that add value to your department, making connections with senior management and other co-workers, and developing lifelong professional skills that will benefit you throughout your entire career. Currently, I am a SCM Summer Associate working in the Non-Clinical Sourcing department in the U.S. Steel Tower. I aim to shed some light on a typical day in the life of a UPMC SCM Summer Associate. My day begins by taking a bus into the city that drops me off right outside the U.S. Steel Tower (side note, I highly recommend using public transportation to negate parking and gas costs). I sit down at my desk, check my email, and open up the projects I am working on that day. On any given day, I may attend meetings that pertain to my projects, listen in on conference calls, or conduct site visits to a supplier and/or the various UPMC facilities in the area. After lunch is over, I accomplish work that needs to be finished for the day before I hop on the bus and head home. Additionally, I go out of my way to regularly connect with my manager or mentor, for building relationships as a Summer Associate may benefit your career years down the road. My main project as a Summer Associate involved the standardization of UPMC Police/Security uniforms. I initially had to determine what each facility was regularly purchasing, gather information regarding preferences and quality of products, and then recommend a consolidated list of items to Supply Chain and Security Management. My intentions were to help UPMC capitalize its scale and give officers a more professional look. However, the most interesting day occurred when our main supplier informed us that they now have the capability to build an online ordering template specifically for each UPMC facility. The template would allow us to enter the items we wanted our officers to wear, and then the end-users would have online access to purchase gear when needed. Since learning and implementing this new program would drastically expedite the standardization process, it is currently undergoing initial testing. 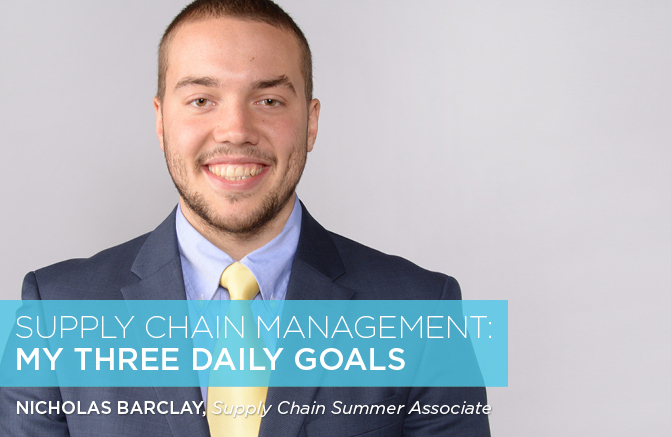 Ultimately, I had three goals every day when I went to work: Take steps to advance my comprehensive project, learn about the behind-the-scenes work in supply chain at UPMC, and have fun in my short time here over the summer. If I was able to accomplish all three each day, I successfully completed a day as a UPMC SCM Summer Associate!